FREEHOLD, N.J. -- A family is suing a New Jersey school district, contending that the phrase "under God" in the Pledge of Allegiance is discriminatory toward atheist children. The lawsuit against the Matawan-Aberdeen Regional School District was filed in state court last month and announced Monday by the American Humanist Association. The group says the phrase, added in 1954, "marginalizes atheist and humanist kids as something less than ideal patriots." "The lawsuit is an equal protection suit seeking to declare unconstitutional the New Jersey state law requiring daily recitation of the Pledge of Allegiance to the flag in public schools," David Niose, legal director of the American Humanist Association, told WCBS 880 Radio in New York. 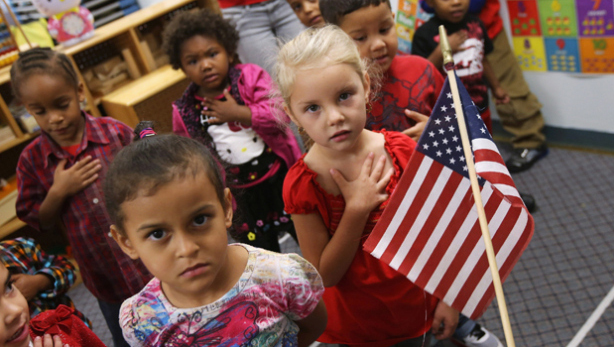 "Children are taught that patriotism is defined a certain way. They're taught to associate belief in God with patriot feelings. Certainly, with that being taught, the atheists look like an outsider. The atheist is stigmatized," he said. The anonymous plaintiffs say those two words violate the state constitution. The lawsuit does not challenge the First Amendment to the U.S. Constitution, Niose noted. "The 'under God' wording is the problematic wording. So if the school was willing to revert back to the original Pledge of Allegiance, which did not include the 'under God' wording, that would be satisfactory," Niose told WCBS 880. "But first and foremost, we just want the current practice declared unconstitutional. From there, the court could go a number of different ways in prescribing a remedy." School district lawyer David Rubin said the district is merely following a state law that requires schools to have a daily recitation of the pledge. He said individual students do not have to participate. The humanist group is awaiting a ruling from a court on a similar case in Massachusetts.